Stand out from the crowd with a personalised batch of Spoon and Mug with Logo Branding and increase your customers and business opportunities. Excellent for advertising, your custom Spoon and Mug with Logo Branding has a unique slot through the handle - with it's very own spoon slotted in. Great when having a lush cup of hot chocolate with marshmellows! Hand out at trade shows and publis events, you can have these 'promotional spoon mugs' sat on your customer's desks, acting as your own little silent salesman. Customise with colour, your artwork and branding and hand out as a business gift! Order today for a free quote and start your advertising campaign! 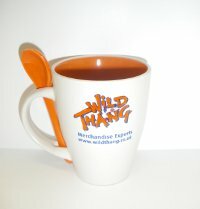 For a FREE QUOTE, please fill in the form regarding our Spoon and Mug with Logo Branding and we'll be able to help you. Why not try our other promotional company gifts below?